Click the links above to view our showcase projects. Because our customers care, we include in the cost of our jobs grain and color matching. The steps involved in this procedure require the placement of two slabs side by side (no small feat when you consider weight and the support needed). 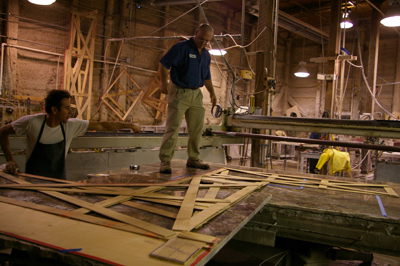 We then adjust the slabs up and down or back and forth until we achieve optimal color and grain matching at the seam. This effort results in extraordinary outcomes for our clients as the seams become far less evident. There is a tremendous wealth of talent at Prescott Stone Fabricators. Our staff is carefully selected to create a balance of background and skill. You, the customer, are the beneficiary of our staff's experience. Collectively, we have created specialized procedures and techniques not employed by other fabricators that add value to your project. Click below for detailed information. All content ©2000-2007 Prescott Stone Fabricators, Ltd.